Oh it is so beautiful!! Amazing job!! 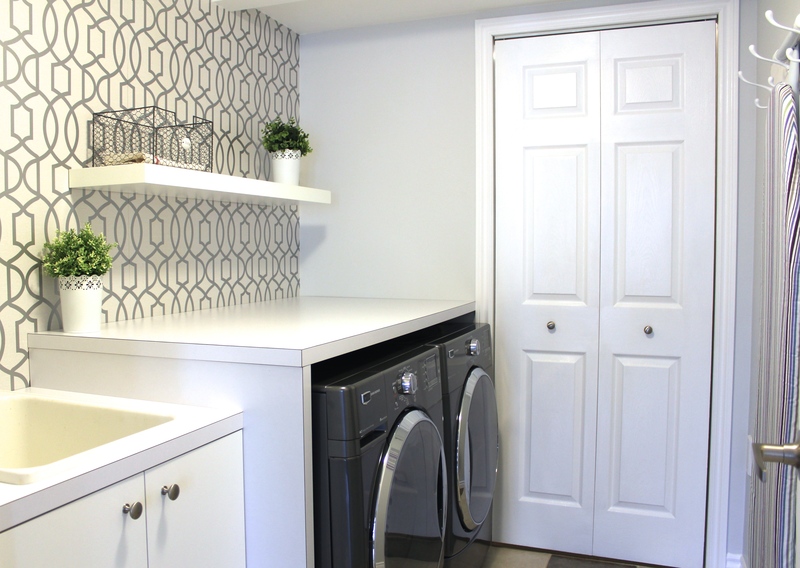 I need to tackle our laundry room next… Thanks for the inspiration! I would actually enjoy doing laundry in this one!!! O.M.G. Paulina! This exceeded my expectation. It looks so fresh and beautiful, much better than your inspiration pics. OMG it’s stunning. 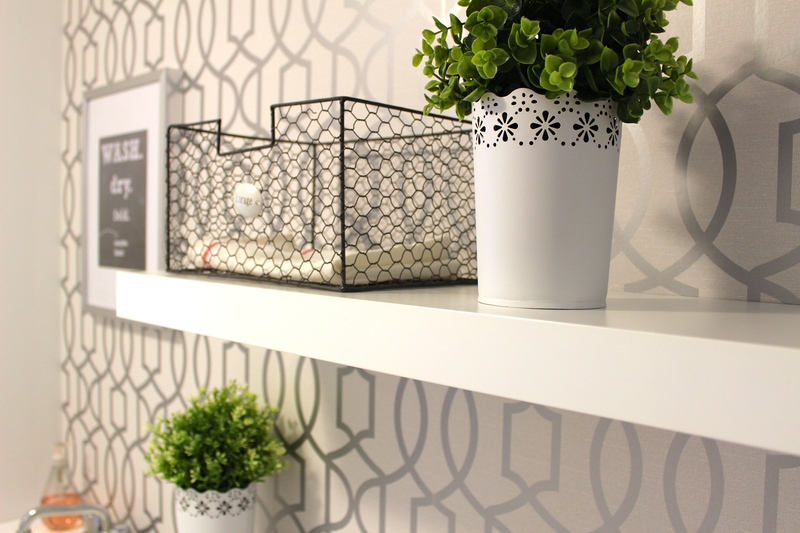 Everything from the wallpaper to the shelves and countertop is just perfection! You nailed it. Awesome job Paulina! It turned out amazing! I love the wallpaper! And I’m jealous of your counter top!!! I can’t believe how much you got done in 6 weeks! Paulina, your laundry room is the stuff dreams are made of! If one was dreaming of laundry rooms that is. It is gorgeous! Haha thanks so much Lisa!! Wow! What a great space. I love the wallpaper! And the clean lines in the room make it feel crisp, like clean laundry should! Nicely done. I am SOOOOOOO jealous of this space. This doesn’t look like a laundry room; it looks like a spa. Fantastic job. Bravo. Wow, just wow! I love this room! I’d WANT to do laundry in this room! I love, love the wallpaper and the counter is amazing! 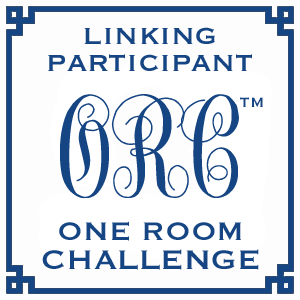 It’s been a blast watching your progress throughout this ORC event! Aww thanks Sheila! 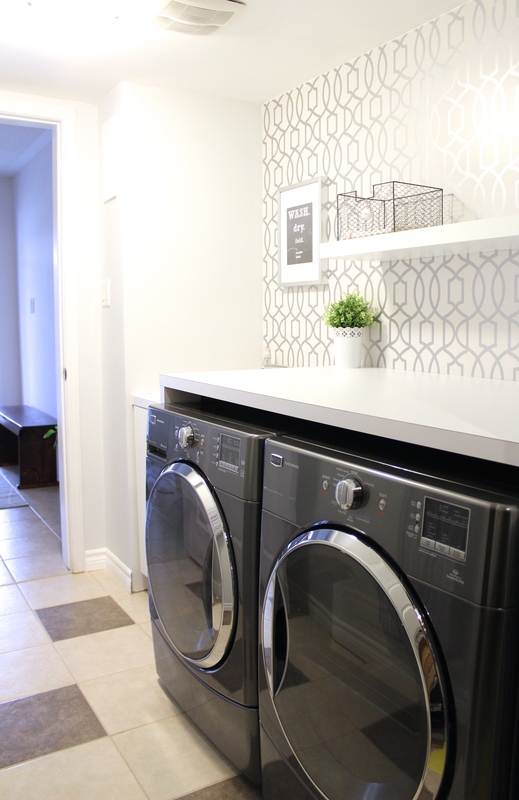 I love what you did with your laundry room too… especially the gift wrapping area! Looks great! You are inspiring me to do over our laundry room. I love the wallpaper, its looks cozy enough in there to sleep! Great job. Lovely laundry room! That wallpaper is a great addition. You will love folding the clothes right there! It looks so polished and pulled together! I love the wallpaper you chose. Great job! Seriously!! This is gorgeous!! I love the simplicity of it, such a timeless design and crisp and clean space. Would love to come and do laundry in there!! Great job Paulina, I have really enjoyed following your room every week, I am sad to have it come to an end too! xoxo. I am in love with your laundry! The accent wall is gorgeous! I would definitely enjoy doing laundry in there! This is one beautiful laundry room! LOVE your countertop and wallpaper. Love this clean inviting calming environment. You did a great job. Would you mind please telling the name and source of the wallpaper? Where to purchase? Thanks so much. Excited to have found you. Hi Karen–I’m so sorry..I’m fairly new to blogging so let me know if I missed anything else. But the wallpaper is from Bouclair. I’m not sure if you’re from Canada or the USA…but I believe Bouclair is only in Canada. 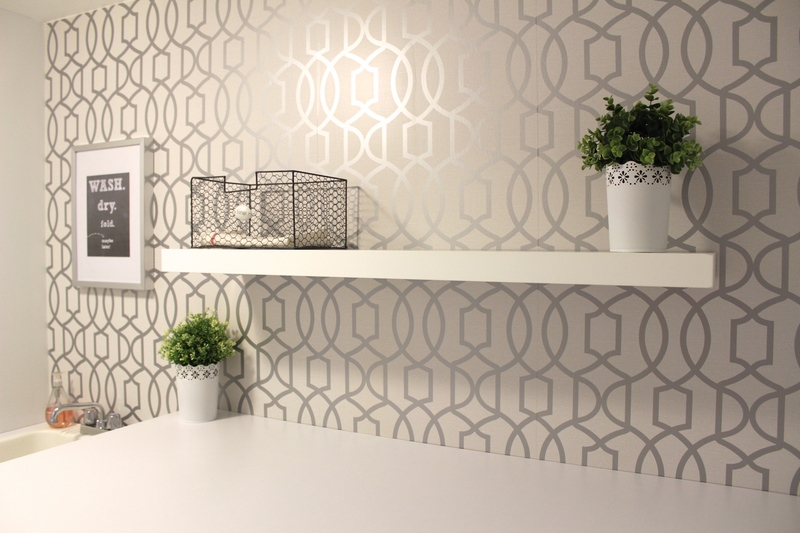 This looks great Paulina – the pattern you chose for your wall is just the right touch of decor here! Love it! CHEERS! If I had that room, I might actually keep up with the laundry! Love how clean it looks! My laundry room may never look this good. What a pretty, bright, and functional space. I love that huge countertop, too. Great job! I hope doing laundry is now more fun? It sure is a pretty space to work in. What a gorgeous space!! You nailed clean and crisp! Love the wallpaper and that print is adorable! Well done!